It’s a month away! 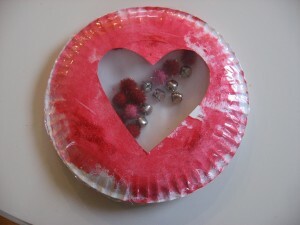 Get your love shaking with this musical Valentine’s day heart shaker craft. There is nothing my son loves more than music (well, maybe garbage trucks) and any craft that can be used for something besides decorating your fridge is a huge plus in my book. The novelty of the peek a boo window made this an even bigger hit! Have fun, shake it and make some music! Gather your materials. 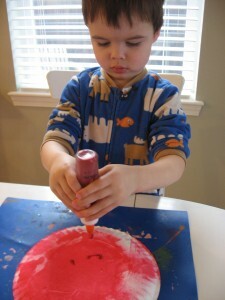 You will need 2 paper plates, red paint, a sponge brush or roller (helps the paint dry faster so you can play with it faster too! 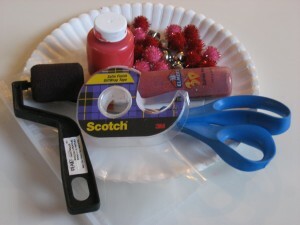 ), some jingle bells, some pom poms, a ziplock bag, packing tape or a stapler, scissors, and glitter glue. 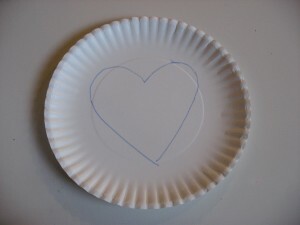 Start by drawing a heart on the inside of one plate. Paint the outsides of both plates. Add glitter if you want! Let dry. We patted ours dry with a paper towel so we could keep going. 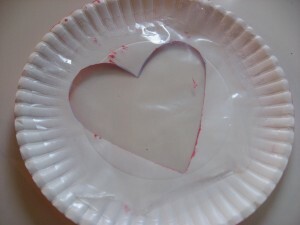 Cut zip lock so that one layer covers the heart opening. Tape well. Pop the pom poms and jingle bells onto the plate. Tape the top to the bottom. We used packing tape because I can’t find my stapler. If you are stapling it make sure that the staples are close together so that no jingle bells fall out. 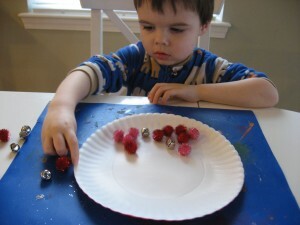 *Also, if you have young ones that are still popping little things in their mouths, try ripped pieces of paper instead of pom poms and dry rice! 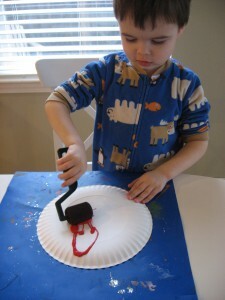 Now you’re ready to shake, shake, shake your Valentine’s Day heart shaker craft! 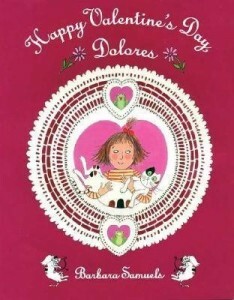 Happy Valentine’s Day, Dolores by Barbara Samuels is hilarious. If you are a sister, you will relate to this book. 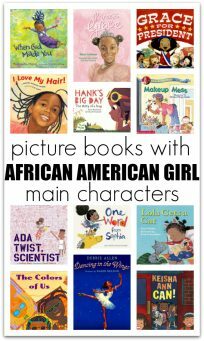 My son didn’t really get it but loved the illustrations especially the one of Dolores in music class. Here is the rundown of the story; Dolores snoops in her older sister’s room. They fight about it and she stops until she can’t take it anymore. Before Valentine’s Day, she sneaks in and finds a necklace in her sister’s drawer. She ends up wearing it and losing it and going to hilarious lengths to get a new one before her sister notices it’s gone. I applaud the author for having her fake a veterinary emergency with ketchup! Very funny, cute book but geared more to the 4 to 6-year-old group. 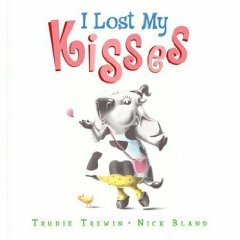 I Lost My Kisses by Trudie Trewin is a cute story about a little cow who has lost her kisses! She looks everywhere for them, gives wonderful descriptions of what kisses are, sound, and feel like, but she just can’t find them. The thing is, she is picking her daddy up at the airport and has to give him a kiss when he arrives! Luckily her heart finds them when she sees her daddy. My son loved this book, he is an affectionate kid and loves to tease us that he is “all out of kisses” so this book was right up his alley! Very cute and I love the mostly black and white illustrations by Nick Bland. .-= Heather @ CSAHM´s last blog ..Are You Qualified to Homeschool Your Child? =-. .-= Rebecca´s last blog ..Land Animals and Zz =-. My son willlove this, thanks! I’m glad to have stumbled upon your blog and look forward to exploring! .-= Beverly´s last blog ..Class Room Friday #6 – Running =-. I just discoverd your site and love it! This shaker is so cute – I’m going to try it at my daughter’s Valentine’s Day Birthday Party! 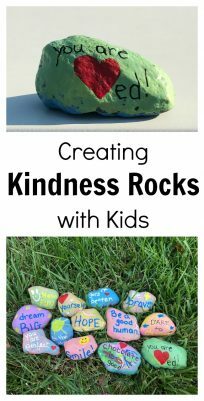 Can’t wait to make this with my 3yo music-lover. Check out the book ‘Somebody Loves You, Mr. Hatch’ by Eileen Spinelli! Oh neato — I love the little window! .-= Desiree Fawn´s last blog ..Gretchen’s Library: Recent Additions =-.